Simple and compact folding system, height adjustable leatherette handlebar with ergonomic grip and just 6.5 kg in weight. Not only will you have one of the most versatile pushchairs on the market, but you will be just as agile when it comes to manoeuvring it, and all with maximum comfort and safety for your baby. ● Seat is suitable from birth thanks to its full reclinable, roomy, removable and reversible seat unit with adjustable footrest. ● Large, extendable hood for protection against the sun, wind and rain. Leatherette ergonomic handle grip and bumper bar. 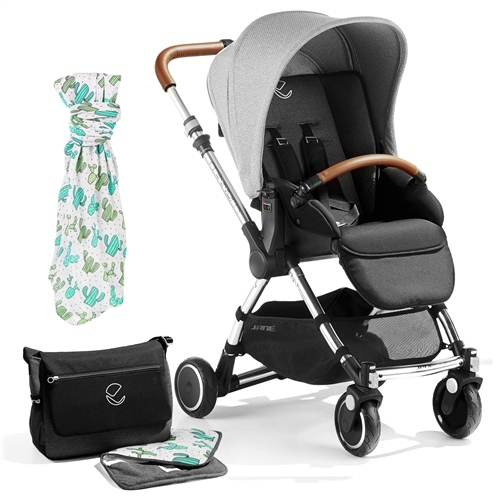 The Jané MINNUM SPECIAL EDITION pushchair / chassis has the Pro-fix system built-in, and the following infant car seats and carrycots are compatible to make the MINNUM into a travel system or pram.